No longer online. A personal website. Presented by a student in Nijmegen, Hannah (right), who was inspired to carve a totem pole after learning about Haida mythology and carving traditions during a tourist trip to the Northwest Coast of Canada. Documents the carving of the totem pole she calls "Giang," a Waldorf School project: "The totem tells more about me then I can express in words. . . The whale is the King of the Ocean, The Eagle is the Ruler of the Sky. The Bear lives on and in Earth and carries the powerful Fire and warmth within him. . . 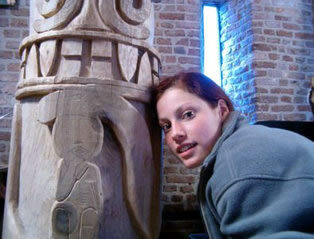 Through the preparing, designing and carving, I grew in the totem and the totem grew in me." From Hannah Wiggins. No longer online. A commercial website. 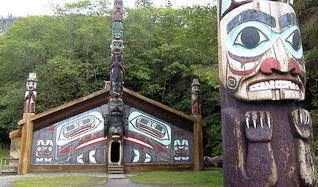 A page on Tlingit and Haida totem poles. Includes a discussion of how totem poles spread throughout the world, the largest poles, and misunderstandings about totem poles: "De betekenis van Totem Palen; Het verschil tussen echte en onechte totempalen; Totempalen lezen; Verspreiding van totempalen; Grote totempalen in British Columbia en Alaska; De laagste man op de totempaal; Misverstanden over totempalen; Totempalen in de wereld." Available only in Dutch. From a commercial gallery. The Kwakwaka'wakw house post at Xwatis (Koskimo) on Vancouver Island was carved by Quatsino artist George Nelson in 1906 (right). It is an ancestral figure with a whale on its chest and coppers on its arms. The Koskimo house post was photographed in situ c. 1914 by Edward S. Curtis for his multivolume book "The North American Indian" (1907 - 1930). By 1955, the post was all that remained of the Sea Lion House at Xwatis. 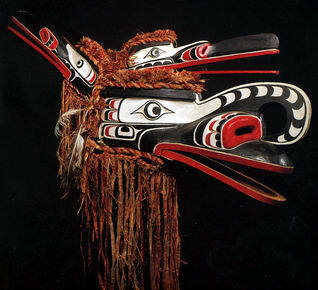 Today it and other artifacts from the potlatch celebration including the dance curtain, headdress, talking stick and the masks are in the University of British Columbia's Museum of Anthropology. House post at Xwatis, 1955. An educational website. The Dutch Indian Club for children presents several pages on the totem poles of BC. An introduction is expanded by a travel narrative of a visit to BC in search of bears and totems: Het land van zalm en ceder (Land of salmon and cedar). Marko Appel and Nicole Schreurs visit some of the more famous totem pole parks. 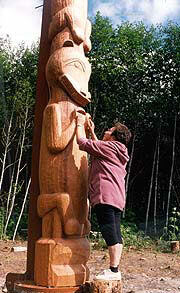 A featured First Nations carver is Susan Point. 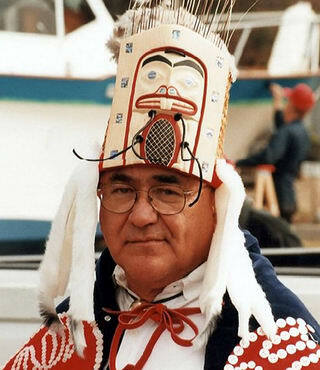 Several stories are presented on the Kwakwaka'wakw, one that includes a photo of 'Namgis Chief Bill Cranmer framed by house posts at Mamalilaculla (right) Available only in Dutch. From Baribal. An educational website. Includes an introduction to totem poles by Hans Westra, a professor of English: "This site is partly based on my correspondence with students and other enthusiasts who wanted to know more about First Nations of the Northwest Coast culture, and particularly about totem poles." What is authentic, he asks, and what is not? (Wat is echt en wat is nep?) 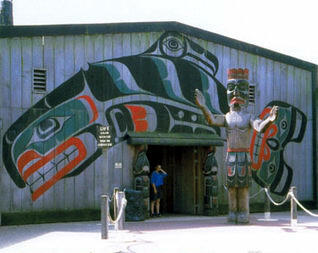 The example (right) is given of the Kwakwaka'wakw bighouse and totem poles created in 1996 by eight Kwakwala carvers at the Dolfinarium at Harderwijk. "Most Dutch people have an idea of Indians that is at least as incorrect as the American picture of the Dutch." From the Van Hall Institute in Leeuwarden. A personal website. Includes a page on a Kwakwaka'wakw totem pole from British Columbia (right). 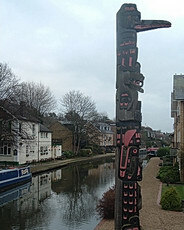 The totem pole is located on a a housing estate at Berkhamsted next to the Grand Union Canal (between London & Birmingham). Earlier the property had been the site of a commercial wood yard. 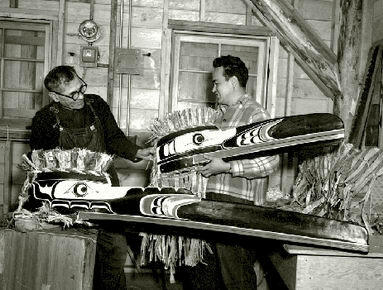 To advertise his wood products, the owner commissioned a totem pole by two Kwakiutl artists from Tsaxis (Fort Rupert): the well known carver Henry Hunt (1923 - 1985), who had apprenticed under Mungo Martin, and his son Tony Hunt (b. 1942). 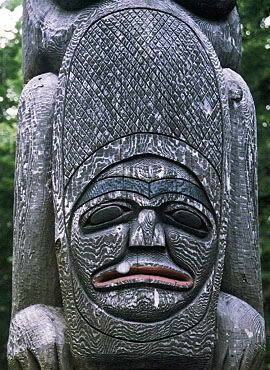 They carved the pole on Vancouver Island and sent the finished sculpture to Britain. 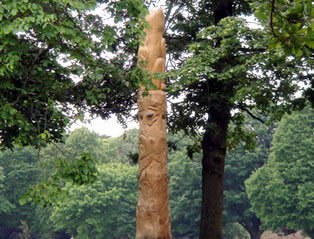 Reference: John Tearle, The Berkhamsted Totem Pole (1998). From Charles Brooks. A photoshare website. One page presents photos taken on 5 September 2007 by Daniel Pett of the raising of an enormous 30 feet high Haida totem pole in the Great Court, built in 2000, of the British Museum (right). The 39 feet high cedar pole came from Kayung near Masset on Haida Gwaii. 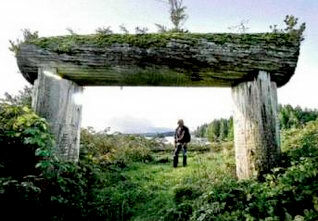 It is one of the finest and oldest Northwest Coast monumental carvings in existance. It was described in 1903 by T. Joyce. External link: A Totem Pole in the British Museum. During its century long ownership of this exceptional totem pole, the British Museum has displayed it in a poorly lit stairwell. In 2007, to celebrate its relocation in the new Great Court, three Haida representatives travelled from Canada to be present at the installation ceremony and recite a traditional Haida prayer. From Daniel Pett. 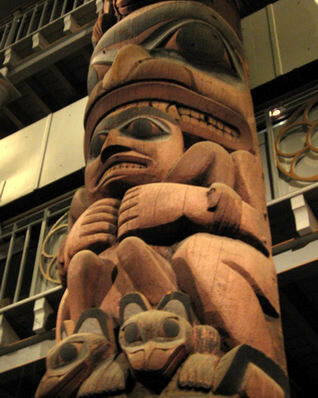 Also newly installed in the Great Court at the British Museum is a Nisga'a totem pole, removed in the 1930s from the Nass River Valley on the Northwest Coast of British Columbia. For many years it had been held in storage, until Nisga'a carver Alvin Tait visited the Museum in 2003. 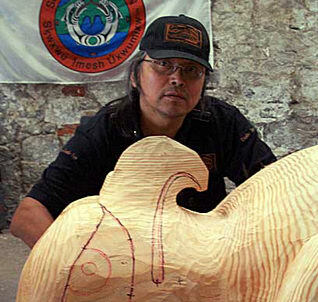 He identified the totem pole as a work by the legendary carver Oyai which had been created in the 1860s to honour Nisga'a Chief Luuya'as of the Eagle Clan. 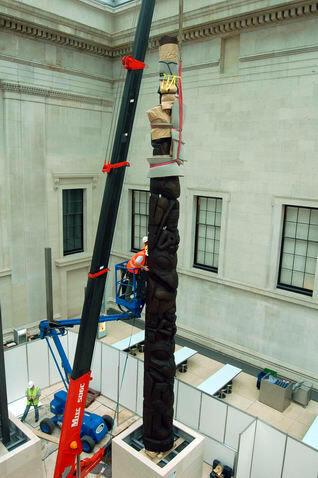 Haida pole, British Museum, 2007. An educational website. One page describes a 11.36 meter hight Haida totem pole (right). The pole originally stood outside the Star House which was built around 1882 in the Haida village of Massett on Haida Gwaii and belonged to Chief Anetlas (c. 1816 - 1893). He had raised it at a potlatch to mark his adoption of a young girl. 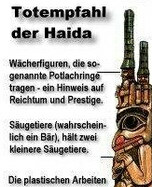 What the circumstances were that caused the Haida chief to sell his exceptionally fine totem pole for a pittance we do not know. Collectors of the time commonly engaged in such unethical "robbery" and today many museums face repatriation demands. 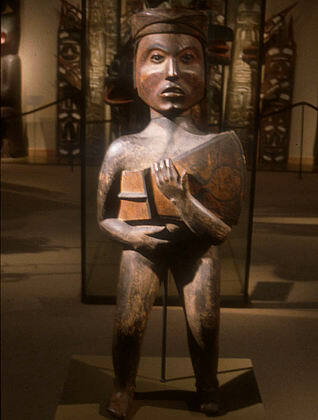 "The pole came to the Pitt Rivers Museum in 1901, donated by Professor E. B. Tylor. C. F. Newcombe, Reverend J. Keen, and the Hudson's Bay Company all helped to obtain the pole, which was purchased for $36 and shipped by rail and steamer. To make transporting the pole easier it was cut in two and the Raven's beak removed." Provides background on the pole, how it was carved, its iconography, and its conservation in 1999. Includes a bibliography. From the Pitt Rivers Museum and the University of Oxford. Haida totem pole, Pitt Rivers Museum. An educational website. One page documents a totem pole project undertaken in 1998 by the Museum Open Learning Initiative and Telematics Centre at University of Exeter for an exhibit at the Royal Albert Memorial Museum in Exeter. See: World Cultures Galleries. 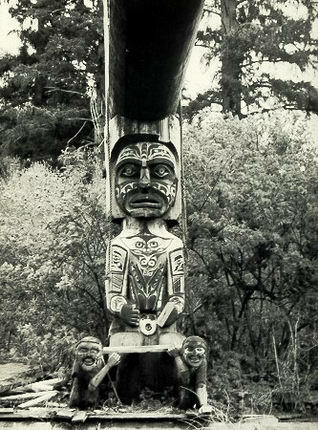 The totem pole (right) was carved in 1998 by Tim Paul, a Hesquiaht artist from Esperanza Inlet on Vancouver Island. Another totem pole by Tim Paul in England is at Yorkshire Sculpture Park. Includes a timeline document of the carving of the totem pole designed for school children: "This site allows visitors to chart the progress of the carving and painting of the totem pole. It also allows you to find out about the cultural events and workshops that were led by various members of the 30 b Nuu - chah - nulth group whilst they were in Exeter. Through this site school children and teachers had the opportunity to ask the First Nation's people questions." From the Museum Open Learning Initiative. Totem pole by Tim Paul. A commercial website. Includes a page on the "Queen's Totem," a totem pole given to the British Queen, Elizabeth II, in June 1958 by the people of Canada. 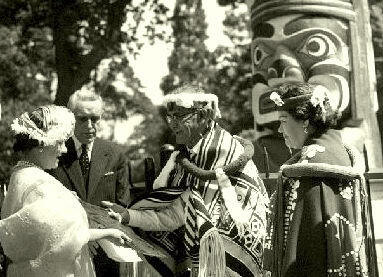 Chief Mungo Martin and his granddaughter Mrs. Helen Hunt, presenting ceremonial copper crest to Elizabeth, the Queen Mother, Windsor Great Park, London, England; royal totem pole visible in background. "The Pole is 100 feet high, one foot for every year, and marks the centenary of British Columbia, which was named by Queen Victoria and proclaimed a Crown Colony on November 19th, 1858. It is now the Pacific Coast Province of Canada." 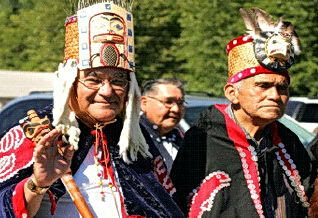 The designer and principal carver was Kwakiutl Mungo Martin (right). "The pole was carved from a single log of Western Red Cedar and weighs 27,000 pounds. 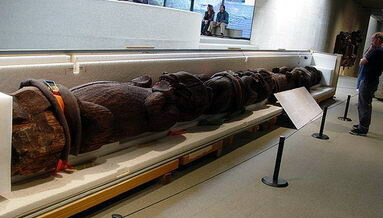 It was cut from a tree 600 years old from the forests of the Queen Charlotte Islands, 500 miles north of Vancouver." From the Royal Windsor Corporation. Totem pole by Mungo Martin, Windsor Park. HRM, Mungo Martin, Helen Hunt, Windsor, 1958. Mungo Martin pole, Windsor, 1958. Mungo and David Martin, Victoria BC, 1955. A personal website. Includes a page on totem poles that quotes Royal Navy Captain James Cook, the first European to report on Northwest Coast totem poles in 1788: "Many of them are decorated with images. These are nothing more than trunks of very large trees . . . set up singly or by pairs . . . with the front carved into a human face; the arms and hands cut upon the sides, and variously painted; so that the whole was a truly monstrous figure." An old Finnish proverb is quoted to contemplate totem poles: "One must listen to the tree under which one's home is located." 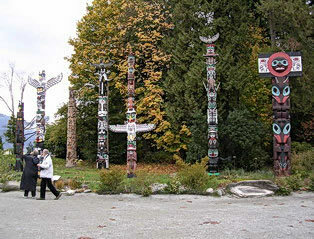 Many tourists visit the totem poles (right) displayed at Stanley Park in Vancouver. From Liisa Berg, Joensuu, Pohjois - Karjala. A commercial website. Markets the carvings of a chainsaw artist who lives in the town of Billigheim in Bayern. 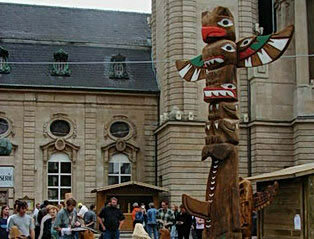 The artist appropriates the emblems and stories of Northwest Coast totem poles for his own German style of carving, such as the whale totem pole he erected in Luxemburg (right). For some First Nations artists like Kwakiulth carver Richard Hunt, traditional motifs and carving styles should be recognized and protected as indigenous cultural property. Interestingly, some of the German chainsaw artist's motifs, such as the eagle and bear, have a long Germanic tradition that dates back to medieval times. Includes a section on historic poles in BC. Available only in German. From Holger Baer. An educational website. One page describes the 1999 visit of three members of the Nuxalk Nation from Bella Coola in British Columbia, Canada. They brought with them to Germany a log over six meters long and one meter thick from an ancient red cedar tree that was about 600 years old when it was felled. Greenpeace commissioned the Nuxalk to carve a totem pole called "Ista" in protest of the destruction of the temperate rainforest of the Northwest Coast for the German wood products industry. 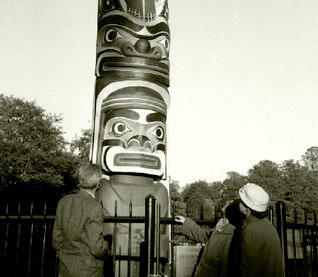 The finished totem pole was toured to 14 cities in Germany, ending in Berlin. Available only in German. From Greenpeace Deutschland. 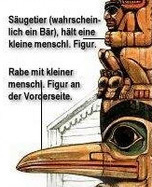 Nuxalk carver Tla´kuulth in Germany. A personal website. 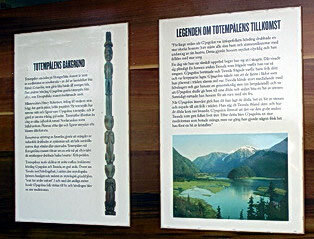 One page is a description with photos of the totem poles at Sitka National Historical Park and the Totem Bight Park at Ketchikan in Alaska (right). The author is a German tourist who took a cruise ship tour through the Inside Passage along the Northwest Coast, leaving from Seattle and travelling north to Glacier Bay National Park with port of calls at several communities including Ketchikan. Available only in German. From Juergen Albrecht. Totem BIght Park, Ketchikan, Alaska. No longer online. A educational website. One page presents an exhibit held in 2005 at the Ethnology Museum in the town of Oettingen in Bayern: "Die Indianer der kanadischen Pazifik Kueste" (Indians from the Canadian Pacific Coast). Indigenous artifacts, totem poles and art from the Northwest Coast were displayed from the cultures of the Nootka, Kwakiutl, Tsimshian, Haida and Tlingit. Available only in German. From Staatliches Museum fuer Voelkerkunde. Some of the objects in the Oettingen museum came from the Museum of Ethnology in Berlin, which early on had one of the best Northwest Coast collection in the world. Its director, Adolf Bastian, had sent the young Norwegian seaman J. Adrian Jacobsen on a collecting trip in 1881 that resulted in more than 3,000 artifacts, among them the sculpture in red cedar of a Kwakwaka'wakw chief which remains on exhibit in Berlin today (right). This work was a favourite of the Berlin museum director, who had an engraving of it reproduced as the frontispiece in his 1883 book "Amerikas Nordwestküste." It was this collection that inspired Franz Boas to embark on his life's passion for Northwest Coast ethnology. A personal website. Presents the North American Indians, with the main focus on the United States. Includes a page called "Weapons, Totem Poles and Masks" that introduces First Nations from British Columbia, Canada. A diagram of Haida motifs is provided (right). The site is regularly updated and features a forum for German "Indian" enthusiasts and an announcement page for the regular events that are staged in Germany to celebrate native culture. Available only in German. From Siegfried Weny. No longer online. An educational website. Includes a page on totem poles by Jamilla Johnston for a university course. Information on the significance, location and exhibition of totem poles with a gallery, articles and links on cultural resources. "First Nations of the Pacific Northwest created beautifully carved columns of cedar totem poles that have become one of their most significant cultural icons. There is no record of when people first began to carve the poles, yet when European explorers arrived in the 1800's they found the tradition to be well established." 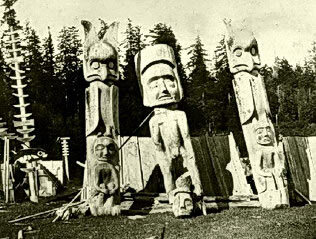 Many memorial poles, such as the ones at the First Nations graveyard at Comox on Vancouver Island, were destroyed by settlers. From the University of Iceland. First Nations graveyard, Comox, c. 1920. A commercial website. Presents the contemporary totem poles in Scotland initiated by the Scottish wood worker Kenny Grieves. Inspired by the totem poles he had seen during a visit to BC, Grieves noticed parallels between carving motifs by First Nations and Celtic symbolism. As part of Treefest Scotland, totem poles were carved as public sculpture at Dumfries, Bennachie, Strathdon, Dunkeld, the Dundee Flower Show and Galloway. 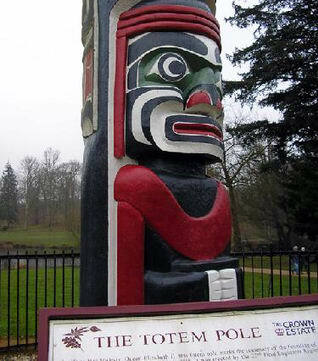 Two totem poles were erected in Aberdeen in 2006; one in Duthie Park (right). 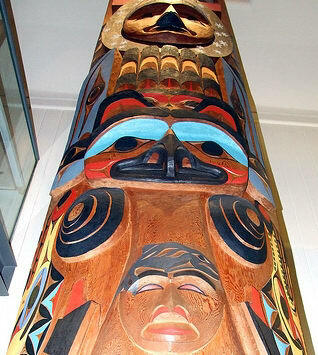 The Prestonungrange Pole was carved from a 32 ft cedar log donated by the Cowichan Tribe on Vancouver Island in BC. It was raised on 18 August 2006. From Brotus Rural Crafts. A governmental website. 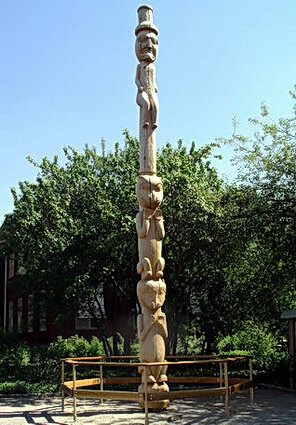 One webpage describes the totem pole commissioned by the Aberdeen City Council as part of a Seaton Community Project in 2007. The Scottish Forestry Commission supplied a 20 foot Douglas fir for the pole and the whole community took part. The design of the pole was inspired by symbols found on ancient Pictish standing stones, except for the top figure which was a carved seagull. Xwa Lack Tun, a carver from the Squamish Nation in BC, led the project and doned his ceremonial robes at the pole raising ceremony to bless the ground and make an offering to Mother Earth. The pole was then cleansed using burning sage. The Scots reported: "We all learned a great deal about the First Nations culture especially their spirituality and the great respect they have for one another and the living environment." From the Aberdeen City Council. Xwa Lack Tun in Scotland. A personal website. Created to educate Swedes about the history and repatriation of the G'psgolox Pole. 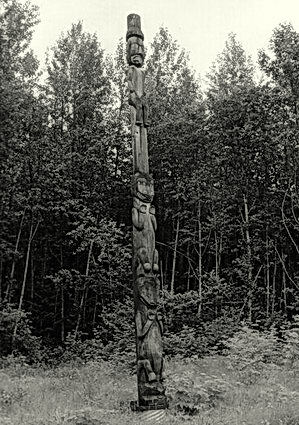 In 1927 the pole was taken from its original location at the mouth of the Kitilope River near the Haisla village of Kitamaat on the Northwest Coast of Canada and sent to the Swedish Ethnology Museum in Stockholm where it remained until 2006. External link: Etnografiska Museet. Following a lengthy repatriation process, the G'psgolox Pole was returned to the Haisla via the Museum of Anthropology in Vancouver. The next stop was on 1 July 2006 when it arrived in Kitamaat to a homecoming ceremony. External link: Na Na Kila Institute. Available only in Swedish. From Karin Malmborg. Louisa Smith: Stockholm (left) and Misk'usa (right). 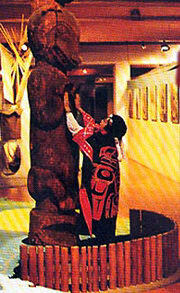 Louisa Smith, Haisla elder and spokesperson and descendant of Chief G'psgolox, greets her ancestral totem pole on display in Stockholm in 1991 (far left). A replica was erected at Misk'usa in 2003, the original location of the pole and the home of Chief G'psgolox (left). In 2006 the G'psgolox pole was repatriated: "100 years after it was carved, and almost 80 years since it was taken from its homelands in Mis'kusa, the G'psgolox Totem is finally home in the lands of the Haisla Nation. . . Our culture and heritage is the basis of who we are and critical to our survival as a peoples; through this repatriation process, we are reclaiming this for our children. . . The original pole is the umbilical cord that ties us to our ancestors, our history and our culture. Our children now have something they can see, touch and feel of our history and our heritage" Press Release, 27 June 2006, Na Na Kila Institute. Haisla pole arrival in BC, June 2006. Totem pole by Sam Robinson (detail).